Architectural design firm Snøhetta, has this month unveiled the new extension it has created for the Lillehammer Art Museum and Cinema in Norway. 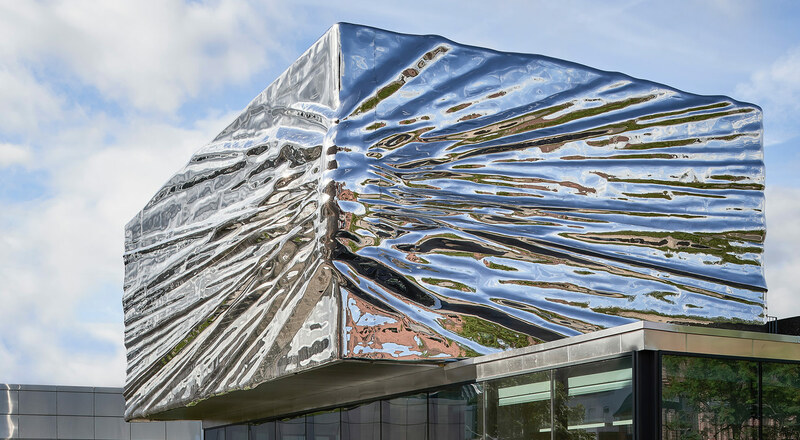 A cube covered with a polished, sculptural stainless steel wrapping is the second expansion the team of Norwegian architects has designed for the Lillehammer Art Museum. It provides additional space for the gallery dedicated to the works of local artist Jakob Weidemann, as well as two new cinema theatres. The cube, the façade of which was designed by the Norwegian artist Bard Breivik, reflects the space surrounding the museum and changes colour with the light throughout the day. A glazed space has also been created underneath to house a children’s workshop. According to the team of Norwegian architects, ‘the cube is conceptually rooted in the sculptural idea of a shooting star, a dramatic symbol of the importance of Weidemann’s contribution to Norwegian painting’. A fitting tribute to the most important Norwegian artist of post-war Modernism. This new steel complex features one interior cinema/theatre, while the second cinema is located below the garden that connects the original building with the first Snøhetta extension. According to the studio, ‘the integration of art, architecture and landscape is an important feature in Snøhetta’s work, therefore, in this latest extension, it has been important to again enhance these connecting spaces, bringing the three volumes together in one complete project’.